cryptonaut-in-exile: The Time Warrior - "Is this 'Doctor' a longshanked rascal with a mighty nose?" The Time Warrior - "Is this 'Doctor' a longshanked rascal with a mighty nose?" Sometimes, the experience of watching a story with a friend makes it more memorable. For example, I'd have no willingness to sit through "The Curse of Fenric" again if I hadn't watched it for the first time on VHS over a friend's house as part of our classic sci-fi viewing sessions lo, those many years ago. Our mutual bafflement, the way that episode made us question our very sanity -- even now I wince and shake my head to get straight -- I'll watch it again (one of these days) just to confirm we didn't miss the bigger picture and it really was a muddled, crappy waste of time and the human spirit. If you're after a story with adventure, Pertwee (well, maybe it's his stuntman in a wig) gets plenty of opportunity to show his action chops in this one. 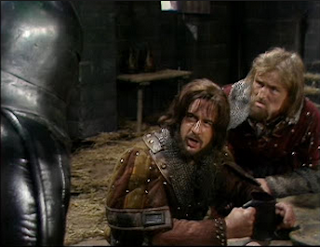 There's a scene where he's attempting to evade capture within the walls of Irongron's keep that is, I think, filmed from atop one of the walls looking down on the action which is unlike any other in the run of the series. It includes a fairly long shot of Pertwee (or the stuntman) running back and forth, tangling with Irongron's men as he hops over bales of hay and such, that feels very dynamic. (I could be wrong about its uniqueness, but I've thought every time I've watched this one, "Why didn't they do that more often?") He also gets to do a bit of an Errol Flynn impression in another action sequence against Linx's robot knight. There really is a lot to like in this one. Irongron and Bloodaxe are a great pair of louts, and Holmes gives them a bevy of great lines. If there hadn't been a Linx, could we have a Strax today? The introduction of the Sontarans in the potato-ish person of Linx in make it worth the viewing all by itself. Now, look, Yuen Woo-Ping had only just gotten started in 1973 and his influence wouldn't be seen in fight sequences here in the West for many years, so we watch these keeping in mind -- as we always must! -- that Doctor Who is a family show made so the parents can watch along with kids. Then, as now, it wasn't being made to push the boundaries of technique or storytelling -- good grief it was often unbearable those occasions when it tried the latter, see my reference to TCoF above -- so we must watch it, and judge it, for what it is. And that was some pretty well done action for an early 70s, low-budget British children's show. Linx gets an earful from Irongron. 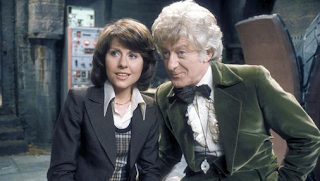 But it's the other first that makes this one more than just worth watching, it makes it special: this is the introduction of Elisabeth Sladen as Sarah Jane Smith. She's marvelous, even if they introduced her by the credulity straining device of having her journalist character penetrating a top secret, military installation with a daft cover story that'd never have worked. But never mind that, our little "narrow-hipped vixen" (thanks again, Mr. Holmes) is a spunky and intrepid reporter with a perfectly natural reaction to being an unwitting time-traveler dropped in medieval England. My advice is to watch it with a like-minded friend, ideally with an adult beverage or two as well, and appreciate Pertwee at his finest, the fresh-faced Sarah Jane, and the dialogue of Robert Holmes.